Students gathered in Scott Plaza Fountain Saturday to run in Up ’til Dawn’s Mustache Dash 5k. 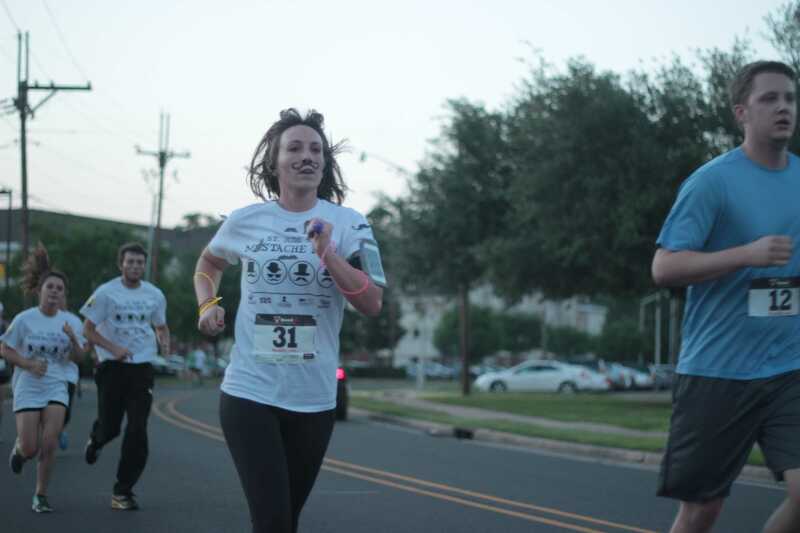 A bright green and white ballooned arch hung over Scott’s Plaza and tables lined with posters of mustached faces dotted the area as ULM’s Up ‘til Dawn annual 5K was about to begin. 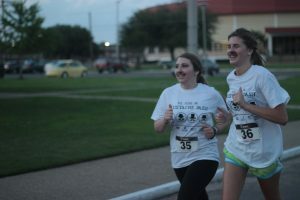 The Mustache Dash 5K brought students and community members together to raise money for St. Jude’s Children Research Hospital. The winner for the men’s division was Nathan Hall, brother of Seth Hall. The brothers meet up every morning at 5 a.m. to run. 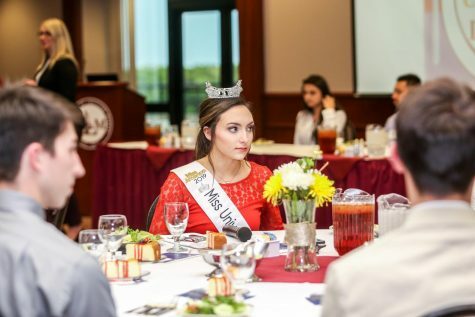 “I think it’s a worthy cause to help out the children of St. Jude and while I was a student here I ran a few races for similar causes,” Hall said. Up ‘til Dawn also gave out prizes for the best real and fake mustaches of the evening. Hall also won for his shapely ‘stache. He said preparing his mustache almost took more time than getting in shape for the race. “It really wasn’t easy with having to trim it. I also had to grow the whole beard, because I couldn’t wear this to work you know. The ‘stache is definitely one of my proudest moments,” Hall said. Hall said he’s more proud of his mustache than he was winning the 5K. Junior Hanna Mosher is production chair of Up ‘til Dawn and helped set up for the Mustache Dash 5K. “Our goal was to raise $30,000, so we were hoping to raise enough with the 5K to reach and exceed this,” Mosher said. All that is needed to begin a new Up ‘til Dawn team on campus is to get together a group of six friends and to register to be a part of the cause. Through small acts such as setting up and coordinating a 5K it is possible to assist a child at St. Jude who is currently in need. Up ‘til Dawn teams across the nation raise money for St. Jude every day.